Blogging is a part of our origin story here at TopRank Marketing. In fact, we just celebrated the TopRank Marketing Blog’s 15th birthday this past December. But despite our blogging longevity, we’re always refining and optimizing, too. 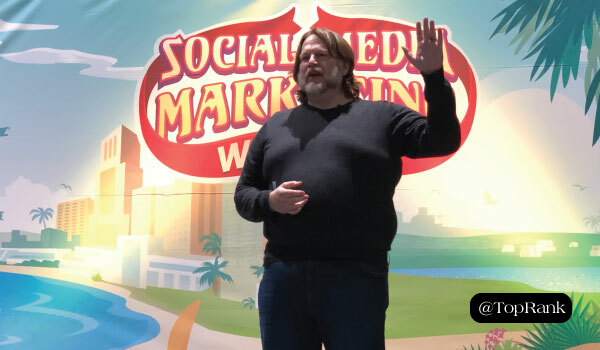 That’s why I attended Chris Brogan’s session on creating a fast blogging framework at Social Media Marketing World 2019. While there, I learned this bestselling author’s approach to writing blog content (and had a few laughs along the way). So, be quick. Get to the point. Don’t complicate things. Don’t write a white paper when it’s supposed to be a blog post. To create blogs, Chris starts at the top of the list and works his way down, checking things off as he goes. But just like most lists, there are items on there that are prioritized. According to Chris, a great title is at the top of the framework because in today’s world “the subject line is the blog post.” Your title or subject line is what gets read the most by your audience. And if it doesn’t pull people in, convey the story you want to tell, and convince them to read, you’ve already failed. But what comes after that? How can you keep people on your blog once they’ve agreed to read it? As Chris said, people only read an average of 19 minutes each day. They don’t have the time to read a long, run-on sentence or a paragraph that refuses to end. Once you’ve finished your blog post, go back and see where you can make it more simple and get to the point faster. Your audience will appreciate the time you’re saving them in the long-run. For us, this doesn’t mean long-form content is out. It means be concise, deliberate, and intentional with your language. If there’s a sentence that isn’t needed, cut it. When it comes to the nitty gritty part of actually writing your blog post, Chris suggests letting go of your stuffy corporate identity and instead be human. Don’t be the brand. Be the person that represents the brand. Show your audience that you have feelings, opinions, jokes, and more. Chris’ last blogging tip is probably the most important: be a guide. Sure, a cool story is fun to read. But is a story really valuable if it doesn’t teach you something? Your blogs need answers to important questions. They need to solve problems. And one of the best ways to do that is to be a guide for your audience, helping them avoid disaster and reach their destination. Content is everywhere—and so is our audience’s attention. As Chris said, we need to strive to create blog post that people actually want to read. For Chris, that means eloquently getting to the point early on to hook readers, and then delivering on your promise in an intentional way. You’re not trying to fill a web page. You’re trying to fill your reader’s mind with information they truly care about. Experiencing FOMO when it comes to Social Media Marketing World? Subscribe to TopRank blog or follow me on Twitter to stay up to date.